Los Angeles Matsuri Taiko perform at JANM’s 2013 Natsumatsuri Family Festival. Photo: Russell Kitagawa. Taiko drumming is energetic, rhythmic, and exciting—the thundering of a taiko drum will catch someone’s attention regardless of how near or far they are. The word “taiko” literally means “fat drum” in Japanese. Historically, taiko drums have been used in Japan for religious ceremonies and local festivals. In feudal times, a one-drum act was typical, but in the 1950s, kumi-daiko—an ensemble made up of different types of taiko drums—was introduced. This is the style that remains popular today. In a taiko ensemble, the biggest drum is called an o-daiko, the mid-sized drum is a chu-daiko, and the smallest is called a shime-daiko. 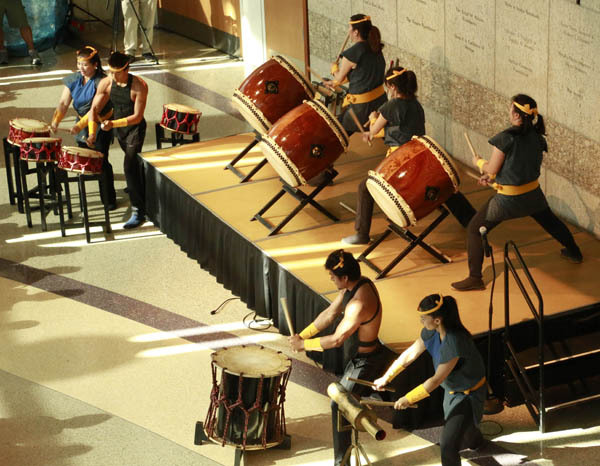 Kumi-daiko can accommodate a variety of musical styles, including jazz and pop. Los Angeles Matsuri Taiko perform at JANM’s 2013 Natsumatsuri Family Festival. Photo: Tsuneo Takasugi. When Japanese immigrants introduced taiko to the United States in the early 20th century, its practice was a way to secure their cultural identity and also to have a collective voice as an ethnic group. Today, taiko drumming can be seen in many different contexts, whether they are traditional Japanese festivals like obon (honoring the dead) or musical revues. Just this past weekend, JANM was proud to host and co-present the 2014 World Taiko Gathering, which united players from around the world for workshops, concerts, and jam sessions. In just a few weeks, taiko will return to JANM when East LA Taiko presents a free performance during our all-day Natsumatsuri Festival on August 9, 2014. A Los Angeles–based group founded in 1991 by Maceo Hernandez, East LA Taiko is a great example of kumi-daiko’s adaptability. The group incorporates Latin and Afro-Cuban rhythms and ska-punk flavors alongside traditional Japanese beats, fusing them into a uniquely LA sound. Hernandez, who has trained in Japan, is a veteran taiko drummer who has performed worldwide. In recent years the group has partnered with singer-songwriter Lysa Flores, who brings her own Latin flare to their performances. Taiko drums are versatile and thrilling instruments. To experience taiko is to experience more than just drumbeats—it’s to hear the hearts, minds and souls of the players. This post was written by Dina Furumoto, one of JANM’s interns through the 2014 Getty Multicultural Undergraduate Internship program. Dina is a student at Cal Poly Pomona, where she is majoring in Sociology.